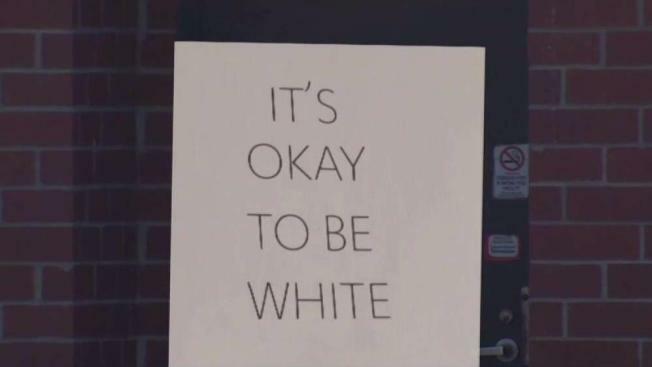 Flyers with the message "It's okay to be white" were found posted outside a Maryland high school early Wednesday, but were removed before students arrived for the day, the school's principal reported. Staff members at Montgomery Blair High School in Silver Spring found the flyers on 10 exterior doors at about 5:45 a.m., Principal Renay Johnson said in a letter to parents. They were removed before students arrived for classes, she said. "We are taking this seriously and are investigating this incident. Our research so far has indicated that this may be part of a concerted national campaign to foment racial and political tension in our school and community," Johnson said. An image from security camera footage released later Thursday showed someone in a light-colored hoodie pulled over their head and wearing blue jeans posting the signs on the doors. Flyers and stickers with similar messages were found in other cities this week, including New Orleans; Cambridge, Massachusetts; and Rocky River, Ohio, The Washington Post reported. According to the Post, the leaflets appeared to be part of an online campaign directing that poster be displayed on "campuses and elsewhere" on Halloween night. "I want you to know that Montgomery Blair is a very smart, diverse and inclusive community and we will not fall victim to attempts to divide us," Johnson said. The school district says they contacted police but will review surveillance footage as a part of their own investigation. Anyone with information about the case is asked to call the school's security team at 301-679-2800.